Once upon a time there was a screenplay for a psychological thriller that may have shown potential. It attracted a capable cast and director, with one Oscar win and multiple nominations on their resumes, as well as an accomplished cinematographer and composer. For a movie called “Dream House”, everything seemed in line to build to build a solid foundation. It’s doubtful that anyone involved in its production knew that the movie would end up like that one property in your neighborhood that is seemingly always under construction and eventually boarded up due to foreclosure. Months leading to its release, it was announced that there had been trouble on the set. Apparently, director Jim Sheridan, a talented craftsman who gave us excellent films such as “My Left Foot”, “In the Name of the Father” and “In America”, had clashed with studio executives from Morgan Creek or Universal (or both, it’s unclear), resulting in him supposedly losing out to the studio. Things got worse as actors decided against doing any press for the film. Even the studio opted against screenings until the night before it came out. With the trailer for the movie revealing quite a revealing plot twist, it appears that nothing good can be salvaged from such a film. All this behind-the-scenes info is shared as set-up since it really can’t be ignored in the review process. Something clearly went wrong with this film, and although I can point out a couple of reprehensible elements responsible for its failure, I may still be at a loss as to what burned this “Dream House” down. Who really loses in a scenario that sees such talent rendered flat and lifeless on-screen? You do, dear moviegoer. That is, if you see this movie. If you do, it will probably be because you thought there might be some scares, or with the title, maybe you assumed there might be a haunted house involved. Negative on both. I saw it out of curiosity. Having enjoyed the previous works of Sheridan as well as stars Daniel Craig, Rachel Weisz, and Naomi Watts (along with my boy, Elias Koteas), I wanted to see for myself what exactly was going on with this movie. I left feeling like I was departing the scene of a crime with no discernible suspects or motives. The story starts out with Will Atenten (Daniel Craig) retiring from his job as a publishing editor, in order to spend more time with his family. His wife, Libby (Rachel Weisz), and their two daughters, Trish (Taylor Geare) and Dee Dee (Claire Geare), are excited to see more of him, as they settle into their new New England home. Domestic bliss is shortened when they experience trespassers and mysterious occurrences that lead Will to a disturbing discovery. It turns out the previous owners of the house were victims of a brutal murder, which may explain why the everyone in his community are acting so strange around them. His neighbor Ann (Naomi Watts) seems to be the only one trying to help him as Will digs deeper into the events that occurred in his house. What is revealed is a devastating realization that challenges not only Will’s identity, but the future of his family. Again, if you’ve seen the trailer, you’ll know I’m being coy with plot information. Too bad the marketing department couldn’t bother with such an approach. 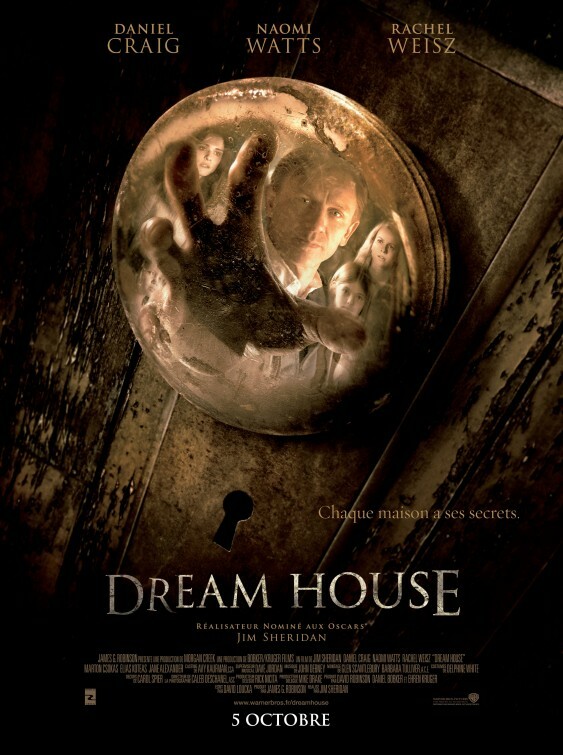 They may have tried to lure moviegoers in with a “The Sixth Sense” or “The Others” vibe, but anyone exhausted with the amount of information given in trailers nowadays probably right away what is going on in “Dream House” and whether or not they want to spend their time on it. There is actually another plot twist in the second half of the movie that is more revealing than what they give away in the trailer, but by then boredom and frustration has set in with viewers. So, who’s to blame? It could be the unfocused paint-by-number script by David Louka, who hasn’t had a great deal of experience or success (looking at his previous work, I think the last movie of his I liked was 1989’s “The Dream Team”, an ironic title). Dramatic elements are set-up early on, but nothing chilling (or thrilling) is ever done with them. It also became evident this is an example of actors off their game. Hey, it happens. With the flat performances by Weisz and Watts, I would’ve loved to see Craig go for some overacting just to rattle some mania into the film. There are moments when we see some palpable emotion conveyed from him, but Craig consistently seems as stiff as everyone else here. Too bad he couldn’t bring the crazy he brought to “The Jacket”. As the movie progresses, it’s obvious Sheridan loses out to sloppy editing and a laughably bad tacky ending involving supporting characters that were barely there to begin with. His last film “Brothers” was well-received, (well, not by me) but I was hoping for something great with Sheridan’s next feature. Seeing as how I was bored throughout this movie (but not necessarily uninterested, if that’s even possible), that didn’t happen here. This is the first movie in a long time where I felt like what I was watching was just there on the big screen. It just existed. That is all. It did nothing for me or to me. Considering the potential for the subject matter, that’s not good. In fact, when you find yourself reconfiguring plot details as you watch a film, that is a sure sign that the movie has failed. Looks like the only good thing that came out of “Dream House” was the Craig and Weisz tying the knot. Congratulations, you two. Now let’s board up this dud and look at more promising property.